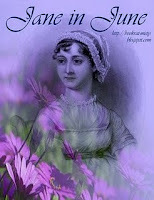 Misty over at the Book Rat is having a month long celebration for the fabulous Jane Austen. Its called Jane in June, and I definitely recommend checking out all the fun. I’m going to be posting some reviews of Austen books, spin-offs and movies as the month progresses. Anybody that wants to join in can head over to the Book Rat and enter their posts on Mr. Linky! 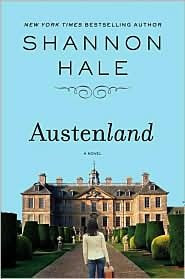 I’m starting off with a review of one of my favorite Austen spin-offs. Its absolutely hilarious, and I hope I can convince everyone to give it a read! How can anyone not think this book is an absolute joy to read? I mean, Shannon Hale dedicates it to Colin Firth. That is incredible, hilarious, and definitely makes her my hero. I love that she did that. Is this book of the same caliber as Pride and Prejudice? Abso-fricken-lutely not. Did Shannon Hale in any way intend for it to be so? No. She wrote a sweet little frolic of a tale for all of us Austen lovers to have a little swoon over. And this Austen fan had just that. Any self-respecting Austen girl worth her Darcy daydreams will fall in love with Jane Hayes on the first page. Because, my friends, Jane has a secret. She is a Pride-and-Prejudice-BBC-movie-watching-Jane-Austen-book-reading fanatic. Aren’t we all? There is one little slip, when a mention is made that Northanger Abbey isn’t worth reading twice. We’ll forgive the author for that one small blip in what is otherwise a perfect piece of fluffy Austen-ey goodness. Jane’s attitude about her Austen obsession in the beginning is hilarious since she is so embarrassed about it. She hides her DVDs (I have mine displayed! No shame here) and keeps all I-must-marry-an-Austen-leading-man thoughts to herself. It makes me feel like I’m part of a secret club with her since I feel the same way (except for the hiding it part. I expect Captain Wentworth to show up any day now). So, and I can’t say this enough, you absolutely must read this book if you are a fan of Jane Austen! It is so much fun to read, as long as you go into it not expecting anything but a good time.